Hello, and Merry Christmas! Today I'm quickly showing you the last few goodies from my Essie advent calendar - days 22, 23, and 24. If you missed any of the previous days, you can find 1-7 here, 8-14 here, and 15-21 here. The last three days included two topcoats, and one gel couture. I'm sure everyones super busy today, so I'll get straight into it! Day 22 was a mini bottle of Gel Setter topcoat, which is said to give the 'cushy, rock hard shine of a gel'. I have no idea if this is intended to be quick drying or not, so I'll have to give it a go and see what happens! 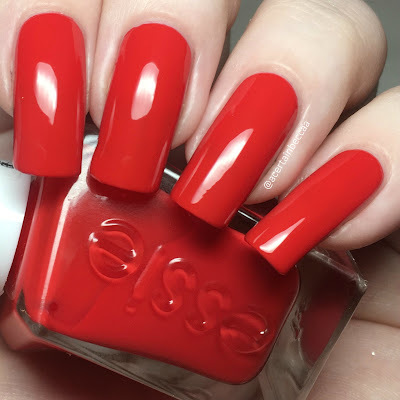 Day 23 was a mini bottle of Gel Couture topcoat, which works alongside Essie's gel couture polishes and claims to be quick drying while sealing, protecting, and giving an ultra glossy finish. Day 24 was full size gel couture polish 'Rock the Runway', a bright red creme. As with most reds, this does start off fairly sheer to begin with. However, it applies smoothly and evenly, and builds up nicely. I found I needed three coats for full coverage, although those with shorter nails may be fine in two. Below is three coats with topcoat. Of course I couldn't end this post without a quick collage. 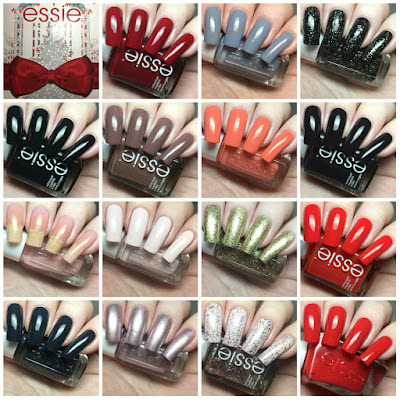 Here are my swatches of all the polishes included in the Essie 2017 advent calendar. What do you think? I've mentioned it in every post, but this calendar has been amazing. 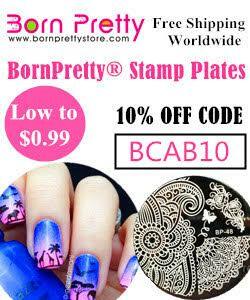 It was such good value for money, and has been packed full of a fantastic range of nail care and nail polish. If this is available again next year, it's definitely going on my wish list!